Grand white marble staircases leading both upstairs & down are bracketed with sensual curved balusters that evoke the Belle Époque, as do a generously proportioned black marble bar and the intricate floor you see in the photo. Windows that soar to impressively high ceilings are swathed in luxurious drapery and a grand piano is expertly played even during lunchtime. So is it any wonder that my companion likened the feel of the room to a grand luxury liner from another age? That extends to the feature I luxuriated in most: sinking into soft dining chairs of supple white leather with low, curved, wraparound backs and arms. 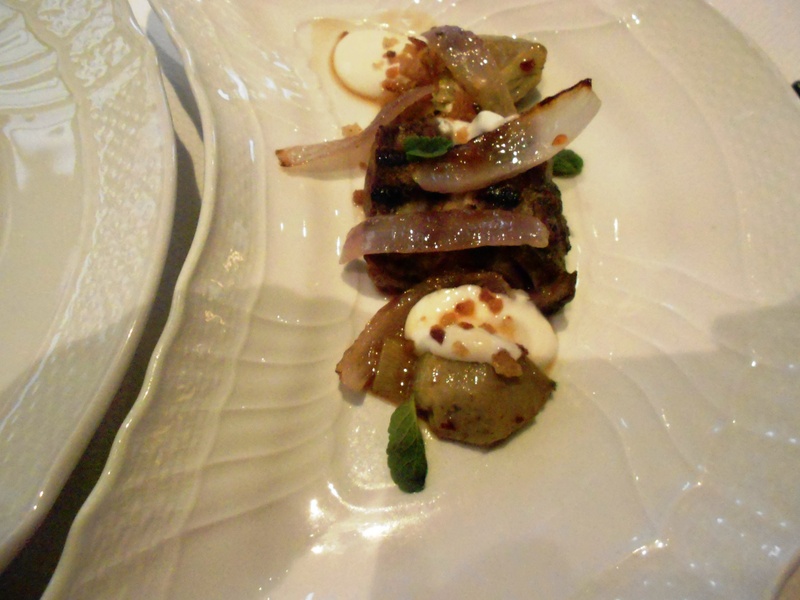 Another reason I chose Del Posto was because it offers a 3-course prix fixe lunch for $49, which seems reasonable – if not an outright bargain – for a restaurant with one Michelin star and a four-star rating from the NY Times. In the end, the tab turned out to be $82 per person all-inclusive. That included a voluntary $10 supplement, but it should also be noted that it was for a meal without wine or cocktails. The pampering starts in earnest with the arrival of gifts from the kitchen. (If you don’t count the stool that is brought for your purse.) Clockwise from the bottom, above: triple-strength capon broth with polenta ball (think fluffy matzo ball), arancini, and puff pastry with pecorino. The broth was tasty but, as would be the case with several dishes to follow, salty. But the one-bite rounds of cheesy, buttery puff pastry shattered and melted beautifully on the tongue, putting me in mind of old-fashioned cheese straws. 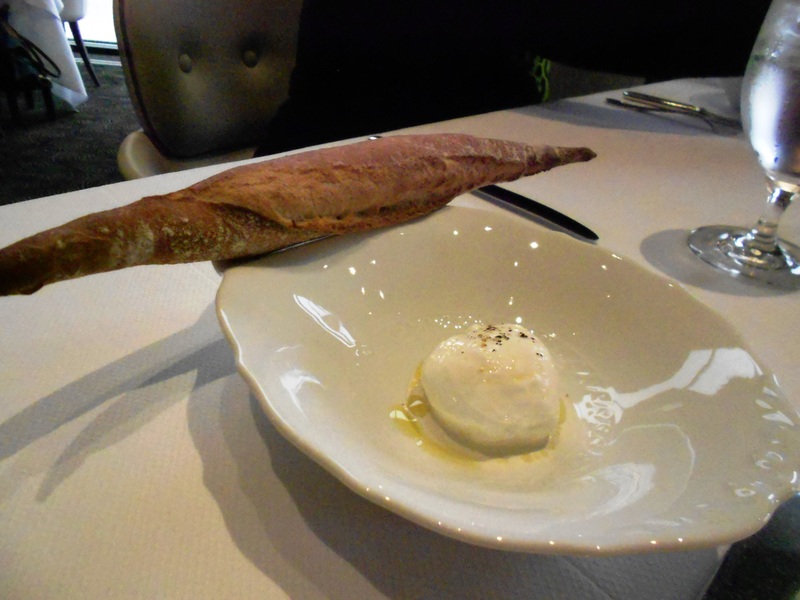 Our server accurately described the above as a cross between a baguette and grissini. Almost worth the price of admission all by itself. 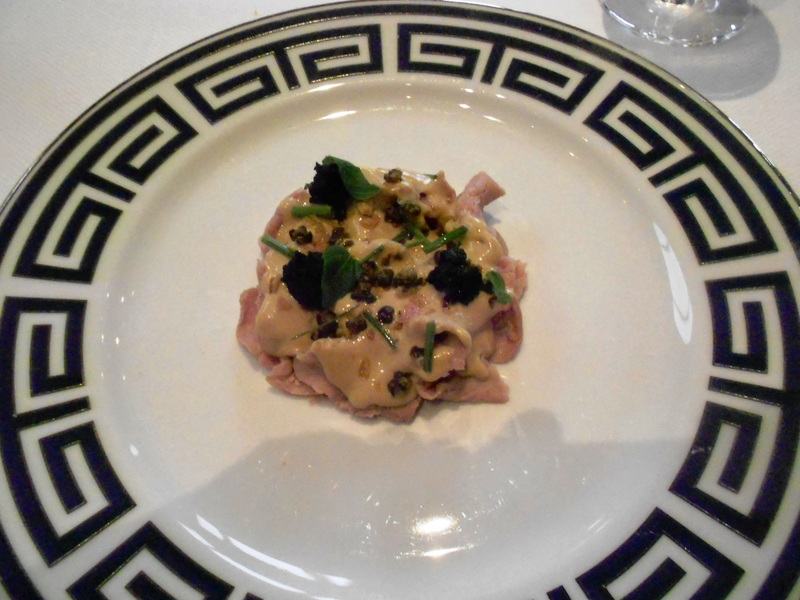 Course 1: Vitello Tonnato with olive crostone (the black crumbly bits, above), caper shoots, lime cells (! 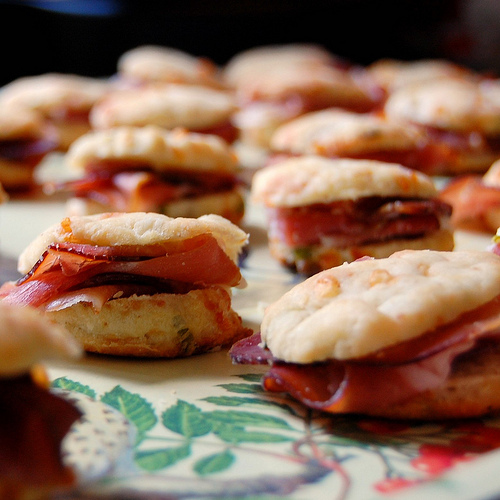 ), and lemon basil. This classic cold dish is a tour de force – slices of tender veal enveloped in decadent mayo-like sauce flavored with excellent quality preserved tuna. The hits of lime and lemon basil balance the richness beautifully. 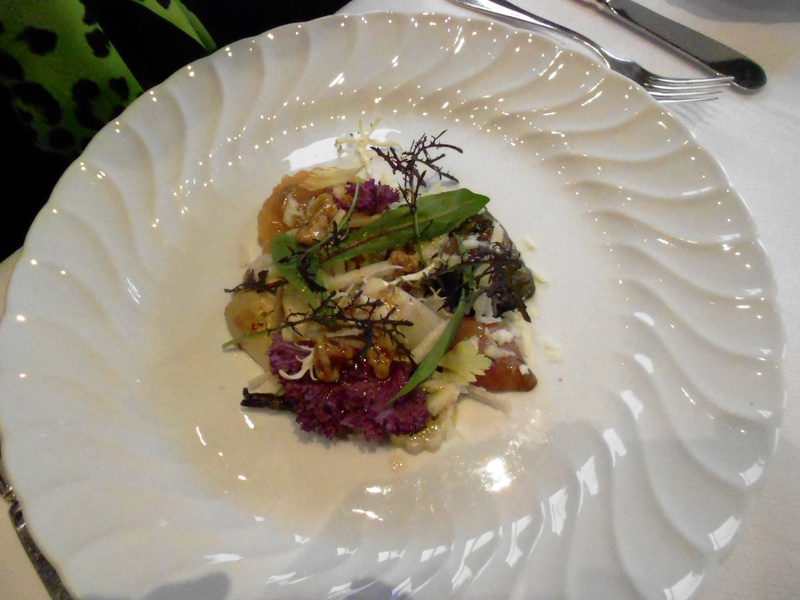 My companion chose to start with salad of slow roasted tubers, which notably includes black salsify and foglie di noce (pecorino wrapped in walnut leaves) among its merits. For the prix fixe lunch, diners choose among 5 antipasti, 5 secondi, and 6 dolci (some with supplemental charges). What isn’t included is primi, aka pasta dishes. 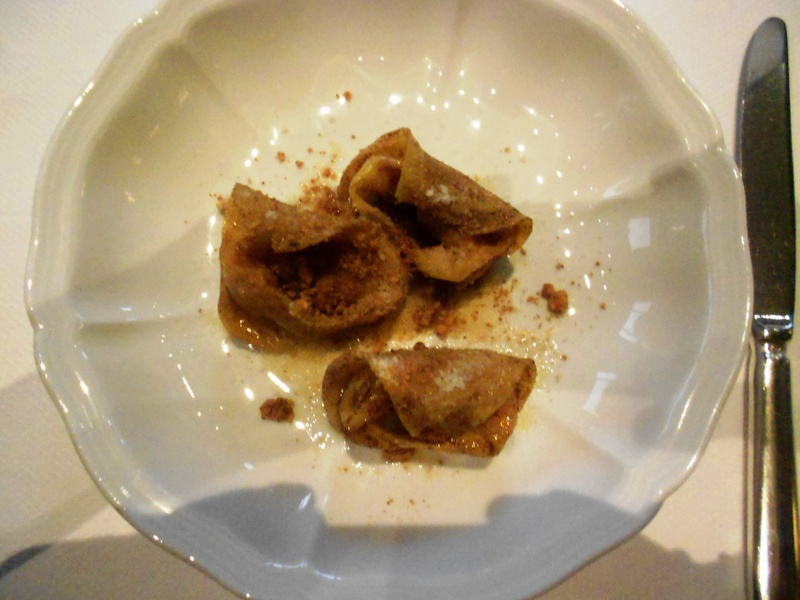 Who could dine at a Batali-Bastianich restaurant without having pasta? 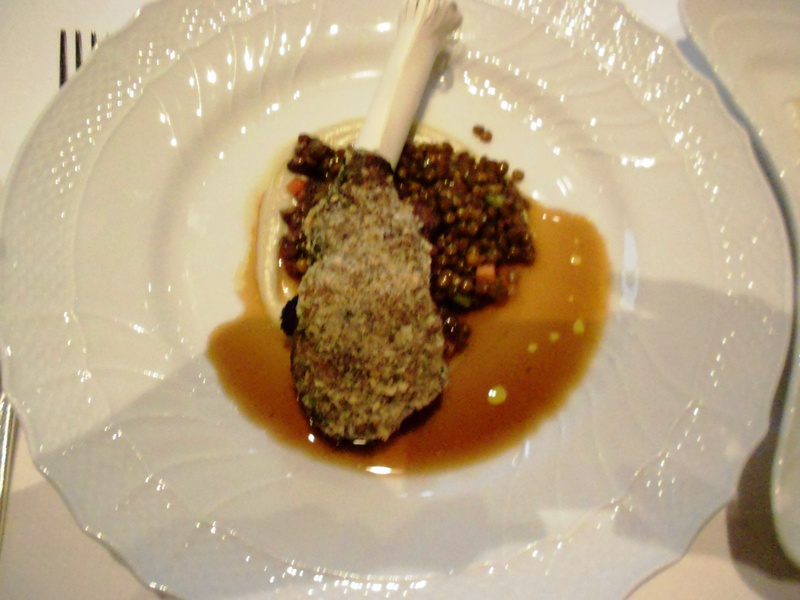 The menu failed to mention a wonderful bonus of boned lamb neck, which happens to be one of my favorite cuts. Soft, beautifully fatty and almost muttony, it sat on more of what I am speculating is artichoke puree. 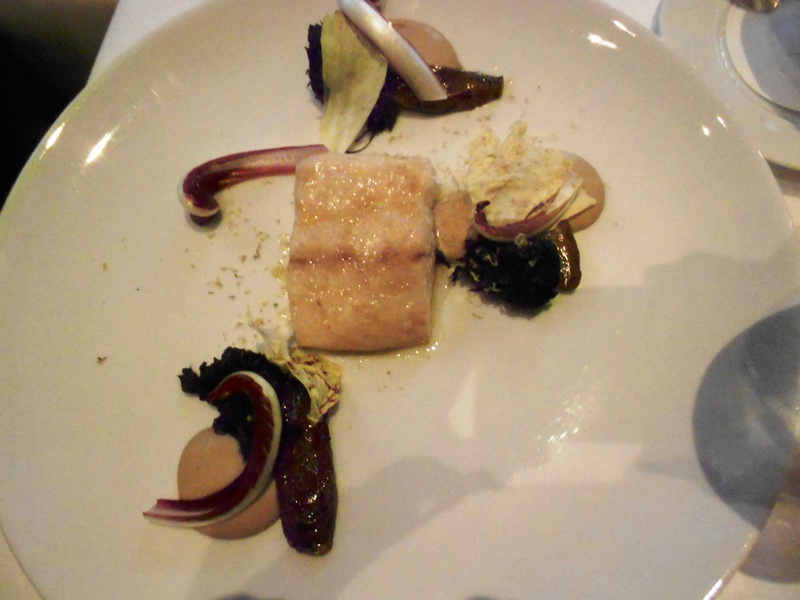 My companion’s choice was wild striped bass (from South Carolina) with radicchio tartivo, chestnut spuma, & Valpolicella and truffle sauce on the side. Her verdict: good, but a bit tame. The same, and nothing more, could be said for both our dessert choices. Both failed to deliver the promise of their menu descriptions. And coffee, at $5 a cup, was surprisingly weak and tepid. 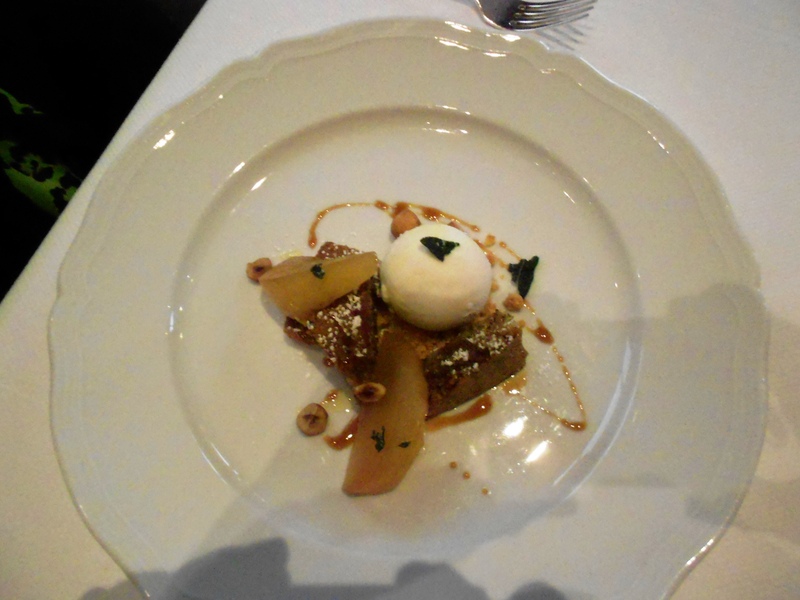 But we ended on an up note: Delicious sweet treats from the kitchen. 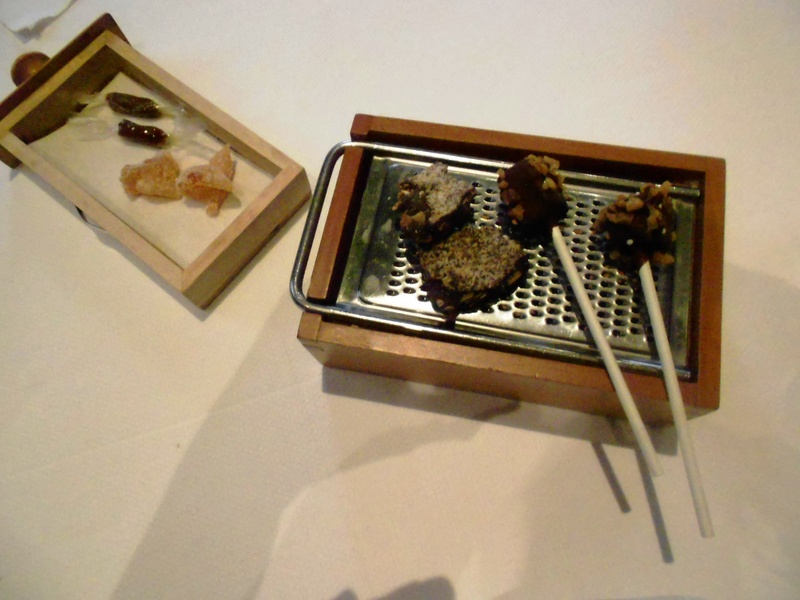 They included dark chocolate pops filled with olive oil gelato, chocolate bonbons, Averna-flavored caramels in edible clear wrappers (! ), and candied melon. Whimsically presented, as you can see, on and in a wooden box grater. 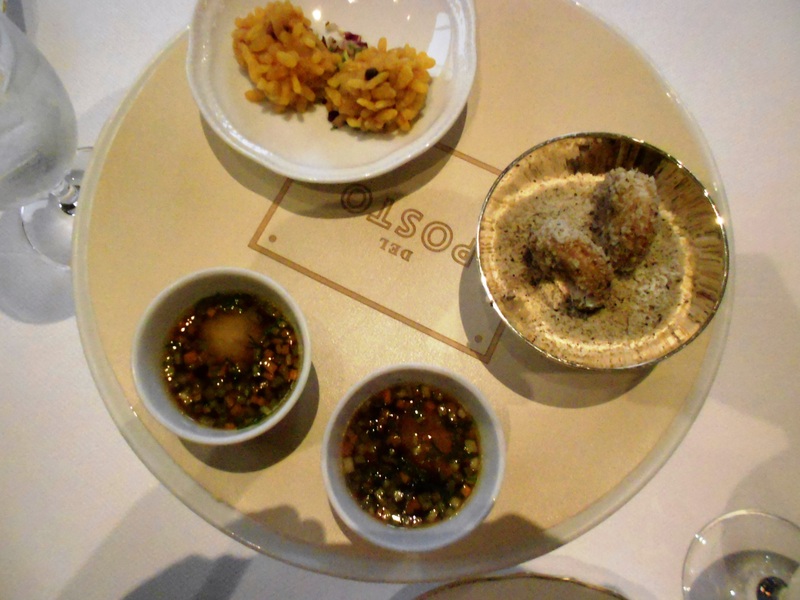 In sum, I would have considered even $82 an acceptable splurge for all this – if only the food had been four stars. Did I mention that as part of the pampering we were presented at the start with warm, moist, cloth finger towels, and that we were asked to relinquish our (thick, soft, linen) luncheon napkins after the main course so they could be replaced with fresh dessert napkins? The pampering here definitely rates four stars. 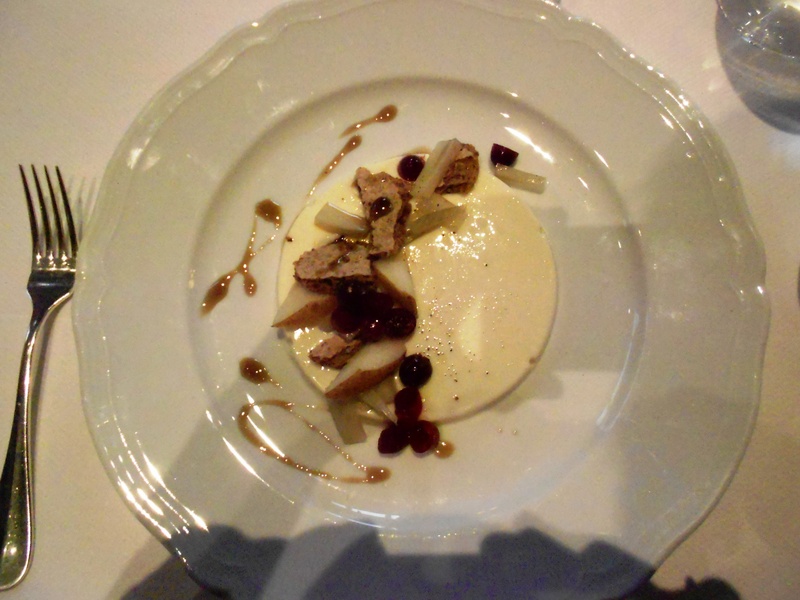 This entry was posted in Restaurants and tagged Del Posto, Joe Bastianich, Lidia Bastianich, Mario Batali, Mark Ladner. Bookmark the permalink.